Colore Pantone 2019 - L.R. 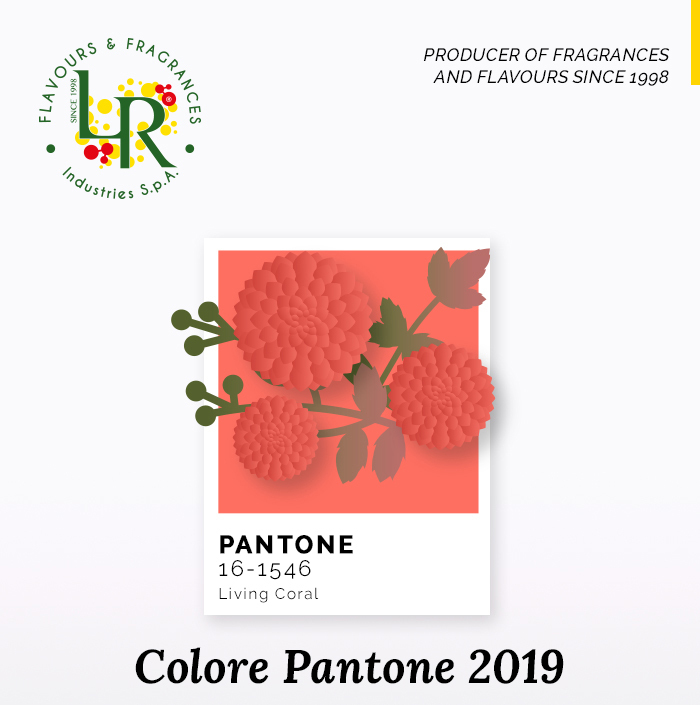 Flavours & Fragrances Industries S.p.A.
Pantone explains: “A shade of coral which animates and affirms life with energy and liveliness. The immersive nature of living coral encourages carefree activities, symbolizing the man’s need for optimism and the desire to carry out joyful activities”. From fashion to industrial design, from packaging to art, from perfumery to food, a range of shades of coral which reminds of exotic countries, burning sunsets and refined, authentic and familiar atmospheres. Dahlia, frangipane and azaleas’ aromas blend with lychee, dragon fruit, marshmallow and macarons’ flavours. Refined, enveloping and sweet summer frangrances and tropical and soft flavours.